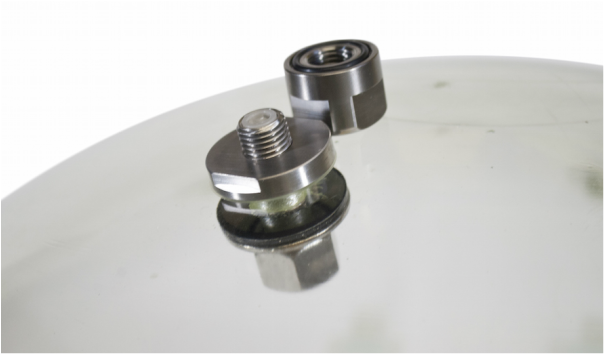 The Purge Port for Glass Spheres (G-101) is designed for applications using a glass sphere housing of 10-20” OD of any wall thickness up to 23mm, and a standard clearance 7/16" D hole with a 1" spotface. The self-sealing purge port bodies are made from corrosion resistant and ultra-strong Titanium 6-4 (Grade 5). As seagoing researchers, these have all the helpful features we want in a vacuum-purge port. “Self-sealing” refers to sea level pressures. They still require the placement of the pressure proof cap before deployment, so as a helpful reminder we laser engraved the words “Replace Cap” on the top. All units are laser engraved with a unique serial number, and are individually tested to 18,000psi. The G-101 requires a clearance 7/16” D hole (29/64”D) through, and a 1.00” OD spotface of 32 RMS or greater on the exterior surface. The G-101 is shipped with mounting hardware and a complete set of spare o-rings. Click here for the G-101 Installation Drawing.